Visited Nailz2U for manicure & pedicure session and I immediately fall in love with the new nail designs they did for me. Guess they NAILED the design really well and I can't bear to take my eyes off them. Upon reaching Toa Payoh, Singapore's weather decided to troll me and let down a heavy downpour but thankful for the wonderful staff at Nailz2U that helped me to settle down at their shop really quickly. (shoutout to Stephane and Kimo!). And they will be serving you a nice cup of warm tea for you to be more relax and de-stress (who knows you might be stress over what design to choose) also. I can go on and on about how nice the staff at Nailz2U are but let's focus on the nails design they did for me shall we? I was given a set of design to choose from and honestly at the start I was telling myself those nails aren't my style. However, both of them did a wonderful job in making some slight changes (especially to the colours) and it suits me really well! 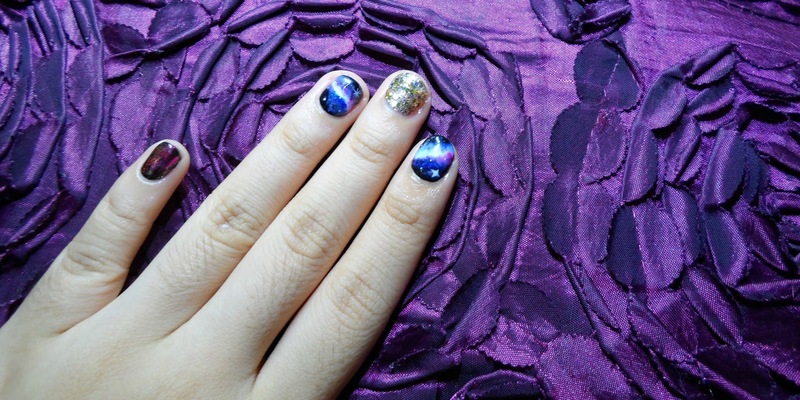 I chose galaxy theme for my finger nails and a simpler one for my toe nails. Initially the colour I wanted for my toe nails was blue (what was I even thinking lol) but Stephane decided to change it to black and white for me to suit the designs on my finger nails. To be honest, both designs I chose were rather challenging and difficult to draw since my nails are pretty small (plus I cut my finger nails prior to the session lol). Thus I was really amazed when the outcome is such a beauty?? For my finger nails, Kimo hand draw the galaxy (as shown on my second and fourth finger nails) can you see how tiny the stars are?? I don't even have the patience and eye power to draw such thing on papers, let alone on my small finger nails. For my toe nails, Stephane hand draw all of it WITHOUT A RULER. Have to emphasize on 'without a ruler' as those are straight lines for goodness sake. And you will really need a lot of patience & practice to make it so perfect (see all the 'P's). I just can't do that man. And because it's black and white, it's super easy to match all my clothes (since it's mostly these two colours only anyway). In conclusion, they are really talented to come out with such amazing nail work. It's definitely not my first time doing manicure/pedicure, but this is my first time receiving such wonderful work. Thumbs up to Nailz2U for great service and great work! If you are interested to received a nicely painted nails for yourself today, why not try Nailz2U? They are having special offers just for you! 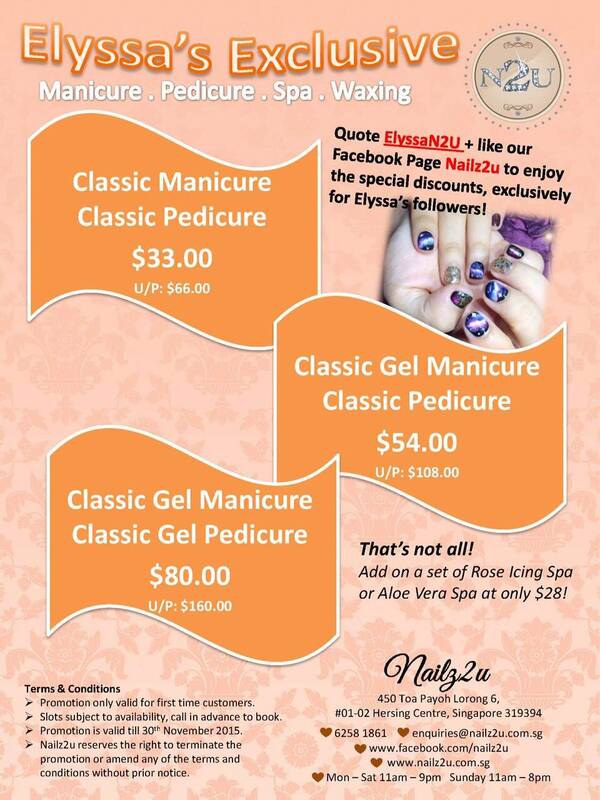 Simply quote "ElyssaN2U" and like their Facebook page to enjoy the following special discount. Click here for more reader benefits. 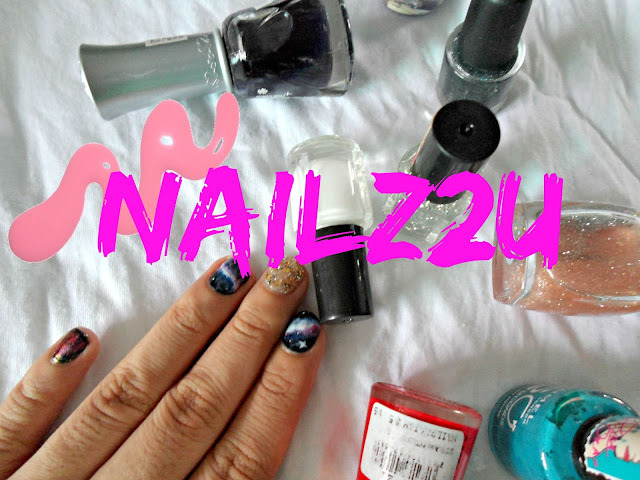 Thank you so much Nailz2U! Can't bear to say goodbye to my nail designs.